Although the regular season NFL games saw a decline in 2017, ad revenue during the post-season increased by +5.3% year-over-year. These figures include the wild card, divisional round and conference championships – the games that took place in January. News Cable News continued to show strong growth in January at 25% year-over-year. 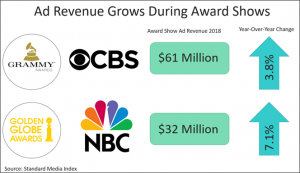 MSNBC, which also reported record viewership this month, earned a whopping 62% more ad revenue than January of last year. CNN increased +32% and FOX News increased +17%. Looking at weekday primetime programming, CNN grew nearly 50% in January year-over-year. FOX News is the most expensive Cable News network for weekday primetime, charging an average $13,600 for an equivalized 30-second spot. Digital In January 2018, Digital increased +16.8% year-over-year. Digital platforms have grown ad revenue on a year-over-year basis in every month since Standard Media Index began tracking the data. Digital’s rate of growth slowed in the second half of 2017 and has been steady around 12% since October. Social Media networks saw the largest growth in January at 42%. Facebook saw the strongest growth at 55%, and Twitter increased its ad revenue 30%. After some early losses last year, Twitter has been growing on a year-over-year basis for the last several months. Video Sites grew 10% in January, with large gains from premium video providers. Hulu increased 20% and Vevo nearly doubled its revenue. 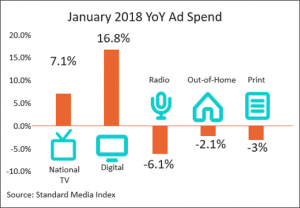 Advertisers by Category Looking at advertiser categories across National TV, the Auto industry was the largest spender in January, although that amount declined by 3% compared to last year. Meanwhile, the Insurance industry was the second biggest advertiser, increasing spend by 22%. Prescription Pharmaceuticals (+4%), Quick Service Restaurants (+10%), Food and Food, Produce & Dairy (-10%) had the largest spend in 2017. 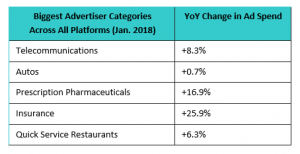 Looking at advertiser categories across all platforms, the Telecommunications industry was the largest spender in January, increasing 8.3% year-over-year. Autos, which were the second largest category, remained flat. Prescription Pharmaceuticals (+16.9%), Insurance (+25.9%), and QSR (+6.3%) make up the top five. IT & Software grew the most YoY, more than doubling its spend.